I’m still working on my Georgian townhouse space planning project; this has introduced me to the more technical (and dark side) of interior design. I’m not a fan of this technical element, so to relieve the monotony of having to research and study anthropometric data (sounds like an impressive word; trust me it isn’t) I have been considering the wall treatments for this office space. To recap; it’s for a (fictional) design company that embraces innovation, creativity and contemporary design. These are buzz words that make me smile and rub my hands together with great enthusiasm. Now, I previously stated that the Georgian influence within this design concept would start and end with the original staircase. My initial design concept was to reflect industrial styling (exposed brick, concrete and factory inspired lighting – all hugely on trend and VERY contemporary), however I decided that maybe it was best to soften these hard edges with pattern. Georgian pattern. Georgian Damask pattern to be more precise. However, I didn’t want overly fussy or intricate designs. Hmmmm, this was going to cause problems. So I pondered a little more and prayed for divine inspiration when I suddenly had a light-bulb moment. Contemporary Damask was the answer. 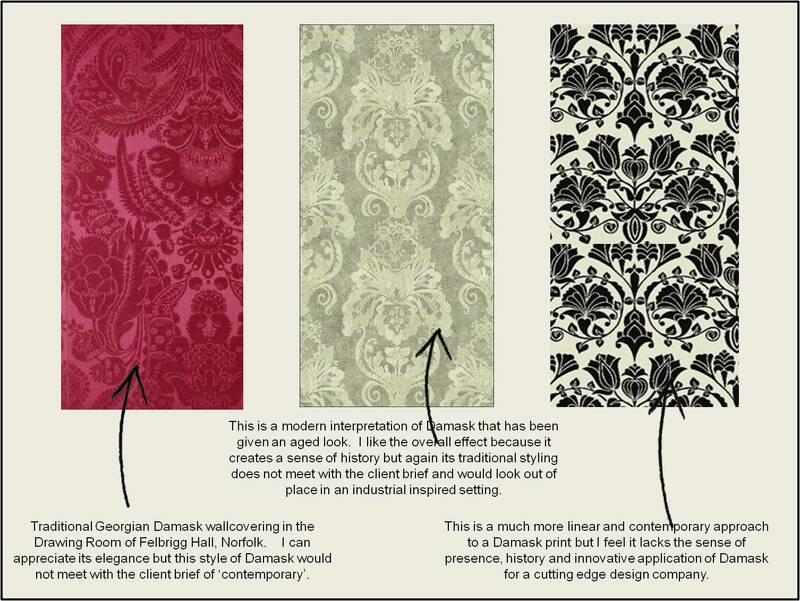 There are many contemporary interpretations of Damask wallcoverings available. But in my head I kept thinking that a distressed and faded Damask print would have been much more effective at delivering my vision. What was my vision? 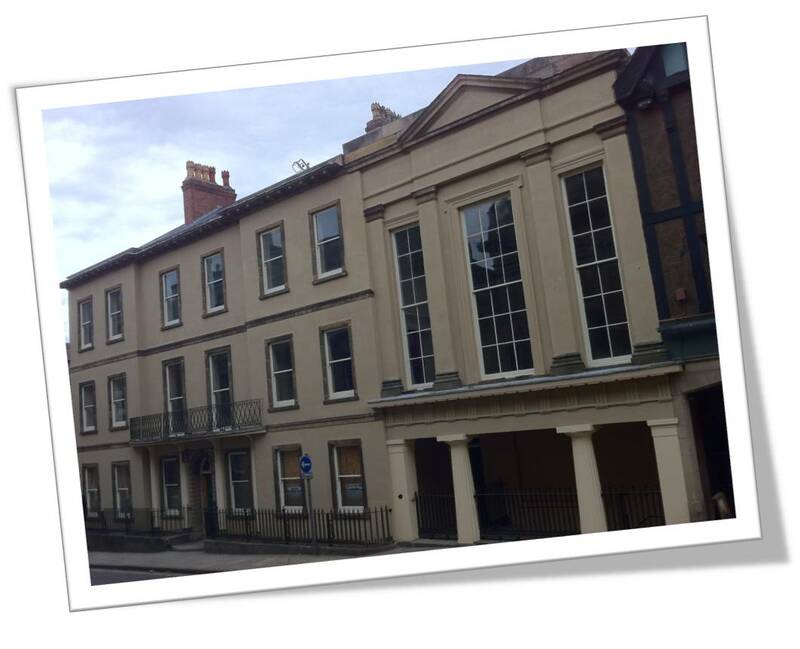 To celebrate and embrace the history of this building and of ‘times gone by’ but in a way that took ‘traditional’ and completely turned it on its head. 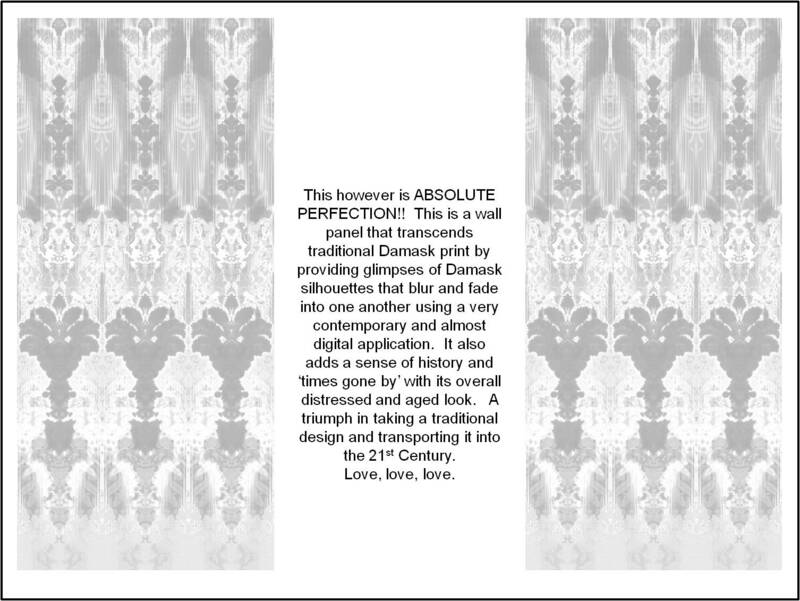 I wanted to do it in a cutting edge manner so that the familiar (in this case Damask) became very unfamiliar. OK enough of the theory; it’s time for visuals. 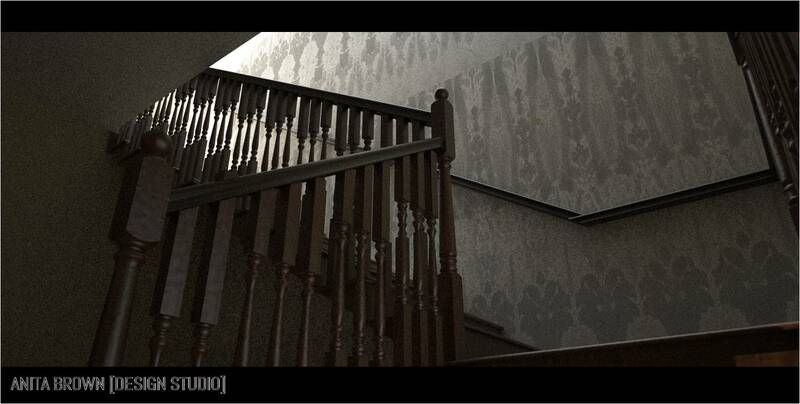 To celebrate this little find I have put together a quick 3D visual of how this wallcovering could look on the expanse of wall at the stairs. One word: amazing. This style of Damask will undoubtedly complement the industrial and contemporary styling of this interior because of its abstract interpretation but it would also soften the overall design because of the elegant floral patterns. AND it’s reminiscent of a traditional Damask print. I’m currently smiling. A lot.